NEW INDIAN EMBASSY BUILDING Indian Embassy Building in Beijing, China, is one of the latest projects executed in a foreign country by a well known team of Indian architects, designers and consultants in Beijing, which Indians can boast of for its excellent design and application of Indian sandstone. The New Indian Embassy Building is the brain child of famous Indian architect: Raj Rewal Associates, New Delhi. Raj Rewal takes pride in telling how Chinese architectural wonders like Longmen Caves located by the side of Yi River and the Statue of the Indian Monk who had taught the Chinese Sculptors around 7th century AD, remained in his consciousness while developing plan for the embassy building. But the architects focused on embassy building's functional requirement of modern office building whose basic purpose is to disseminate knowledge about India to China. Of course, the basic purpose of an embassy is to create friendship and goodwill among the people of two countries. Embassies today act as messengers which convey news, arrange commercial transaction and cultural celebrations. The Chancery building of the embassy is the central feature having four courtyards around it. The entrance ceremonial court is approached from the main road and would be opened to receive prominent guests. The entrance is approached through a sandstone paved square flanked on one side by a multipurpose hall forming a threshold defined by a delicate sandstone jaali(trellis) based on symbolic circular design. The impressive entrance of the building is enclosed by columns which support the proluding floors at upper levels casting deep shadows and protecting the lower levels from sun's rays in summer and snow wizards in winter. The cantilever surfaces of the Chancery almost serve the purpose of traditional Chinese pagoda. The central feature of the Chancery complex is an atrium covered with a glass dom. It follows the design of basket weaves and farmer's hat, common both in India and China. Elements on the façade of the building like balconies, trellis and cladding materials of sandstone formulate on architectural vocabulary that is based on the inspiration from the past and an authentic structural and functional response to the contemporary needs of a modern office. The new technique of stone cladding with square modular sandstone incorporates the essential insulating material on steel framing to counter the freezing winter of Beijing and hot summer months. The window openings are carefully proportioned and are deeply set within a framework of stone mullions and sure breakers. The beige and pink sandstone panels alternate on the façade to create a rich sculpturesque surface highlighting the intrinsic texture and tonal values of Indian sandstone. 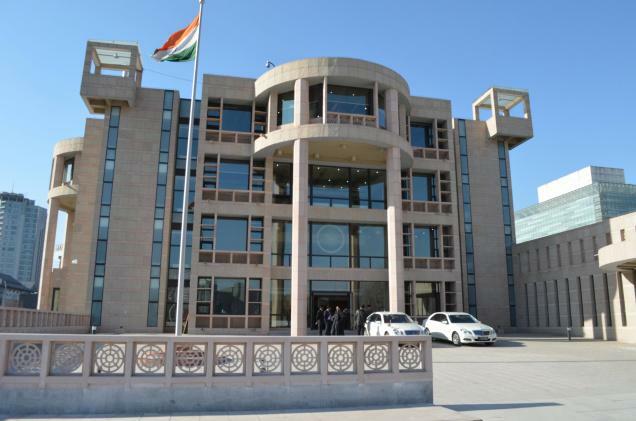 The new Indian Embassy Building in Beijing was jointly opened by Indian External Affairs Minister S.M. Krishna and Chinese Vice Foreign Minister Chen Guoping.